The Mobile Warming Bluetooth®-enabled battery-powered Rover Heated Dog vest is designed to keep your pet warm in cold weather conditions. The rover vest comes in 2 sizes: Rover for larger dogs and Rover Mini for toy-sized pets. The Rover Heated Vest is made from a lightweight nylon fabric that keeps your pet warm in chilly conditions. It has stylish looks that are perfect for around town, a trip to the park, or up in the mountains for a hike. The Rover is made with a light-weight 100% polyester outer shell with a quilted, synthetic down core that’s easy to clean and dry after a romp in the park. The Rover includes a neck collar slot for on-leash activity and our exclusive Phoslite® reflective safety trim. Phoslite® is an industry exclusive reflective technology that is used for enhanced visibility at night or other low visibility conditions. The Rover Heated Vest uses powerful yet light-weight rechargeable lithium-ion batteries that power our exclusive Far-Infrared Heating System. 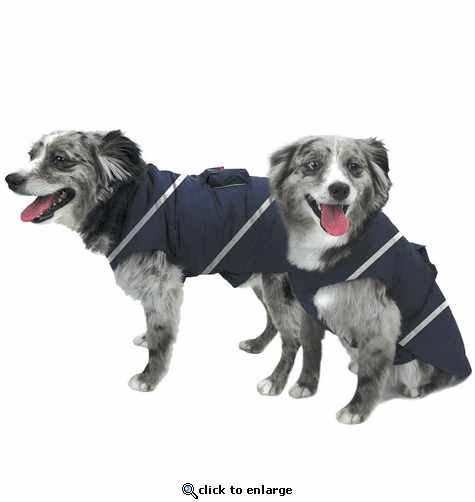 The heating system has two heating elements, two placed strategically across your pet’s back, which add heat to critical areas that keep their core warm. The Rover’s heating system can provide temperatures ranging from 104°F on high to 90°F on low. On high, expect up to 6.5 hours of heat. On low, the Rover Vest can provide heat for up to 13 hours! The Rover has two ways to adjust the temperature. First, the built-in touch control button. With a simple button push, you can select from four heat settings. Second, we’ve incorporated Bluetooth® control with our MW Connect™ app. Through the MW Connect™ app, you can quickly toggle through all connected Mobile Warming® devices and adjust individual heat levels to your liking. MW Connect™ allows you to get real-time updates on battery levels and update your pet’s vest when new firmware becomes available. From a stroll through the park to your favorite hiking trail, the Rover Vest keeps your pet warm and comfortable in any activity.